Lost in the Snow is excerpted from Twain's novel, Roughing It (1872), chapter XXXI. We certainly had been following our own tracks. Ollendorff and his “mental compass” were in disgrace from that moment. After all our hard travel, here we were on the bank of the stream again, with the inn beyond dimly outlined through the driving snow-fall. While we were considering what to do, the young Swede landed from the canoe and took his pedestrian way Carson-wards, singing his same tiresome song about his “sister and his brother” and “the child in the grave with its mother,” and in a short minute faded and disappeared in the white oblivion. He was never heard of again. He no doubt got bewildered and lost, and Fatigue delivered him over to Sleep and Sleep betrayed him to Death. Possibly he followed our treacherous tracks till he became exhausted and dropped. 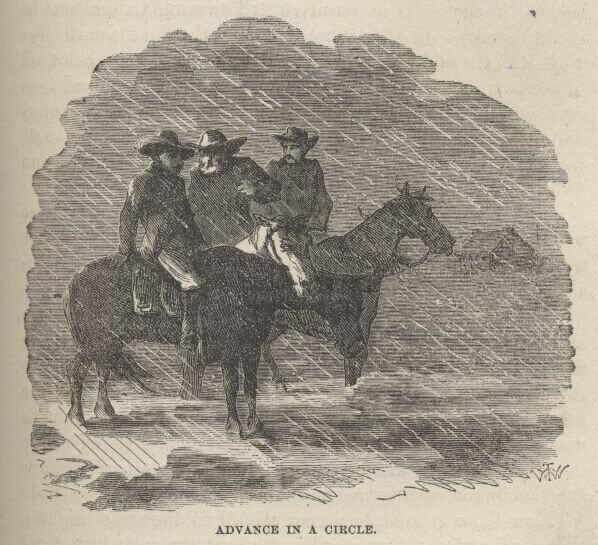 Presently the Overland stage forded the now fast receding stream and started toward Carson on its first trip since the flood came. We hesitated no longer, now, but took up our march in its wake, and trotted merrily along, for we had good confidence in the driver's bump of locality. But our horses were no match for the fresh stage team. We were soon left out of sight; but it was no matter, for we had the deep ruts the wheels made for a guide. By this time it was three in the afternoon, and consequently it was not very long before night came—and not with a lingering twilight, but with a sudden shutting down like a cellar door, as is its habit in that country. The snowfall was still as thick as ever, and of course we could not see fifteen steps before us; but all about us the white glare of the snow-bed enabled us to discern the smooth sugar-loaf mounds made by the covered sage-bushes, and just in front of us the two faint grooves which we knew were the steadily filling and slowly disappearing wheel-tracks. Now those sage-bushes were all about the same height—three or four feet; they stood just about seven feet apart, all over the vast desert; each of them was a mere snow-mound, now; in any direction that you proceeded (the same as in a well laid out orchard) you would find yourself moving down a distinctly defined avenue, with a row of these snow-mounds an either side of it—an avenue the customary width of a road, nice and level in its breadth, and rising at the sides in the most natural way, by reason of the mounds. But we had not thought of this. Then imagine the chilly thrill that shot through us when it finally occurred to us, far in the night, that since the last faint trace of the wheel-tracks had long ago been buried from sight, we might now be wandering down a mere sage-brush avenue, miles away from the road and diverging further and further away from it all the time. Having a cake of ice slipped down one's back is placid comfort compared to it. There was a sudden leap and stir of blood that had been asleep for an hour, and as sudden a rousing of all the drowsing activities in our minds and bodies. We were alive and awake at once—and shaking and quaking with consternation, too. There was an instant halting and dismounting, a bending low and an anxious scanning of the road-bed. Useless, of course; for if a faint depression could not be discerned from an altitude of four or five feet above it, it certainly could not with one's nose nearly against it. Add Lost in the Snow to your own personal library.